Nana and Grandpa had to leave tonight but before they left they had a great day hanging out with the Wombats. 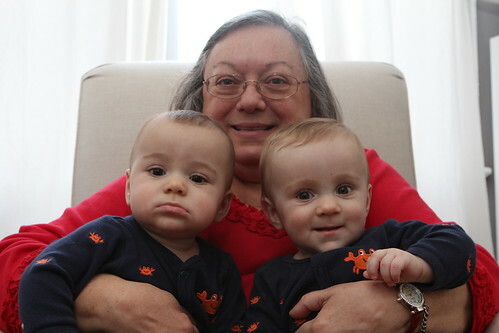 Despite the ultra-serious looks on their faces they were all smiles with their grandparents today. For some reason Martin got extremely solemn at one point in the afternoon and just sat on the couch staring at Nana STIM. He didn't cry and he didn't smile. 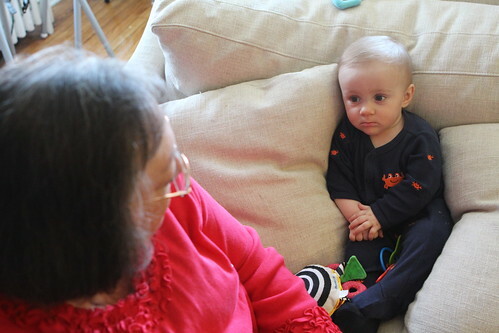 He just sat there and regarded his Nana with suspicion. This lasted about 30 minutes. Later in the day Martin sat in the rocker with his grandpa for the better part of two hours and seemed to have a blast. This marks the longest period of his life where he has ever been content in doing one thing. I am alwas pleased when I put them in their footie pajamas because that means Martin cannot remove any socks and try to eat them. After I did the laundry and put the clean laundry on the couch he plucked a clean sock from the pile and stuck it in his mouth. If he could talk he would have said: "Check and mate, Dad!" 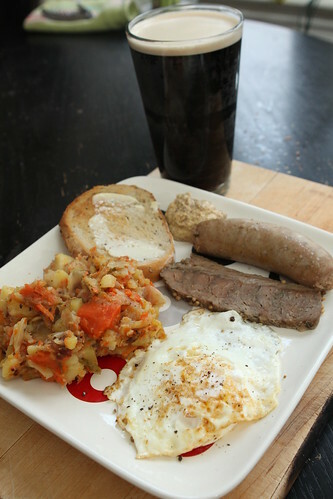 For dinner I used up the rest of the leftovers from St. Patrick's Day by making this bubble and squeak with bangers, corned beef, fried egg, mustard, rye toast, and Murphy's Irish Stout. A fitting farewell meal to celebrate all 5% of our Irish heritage. 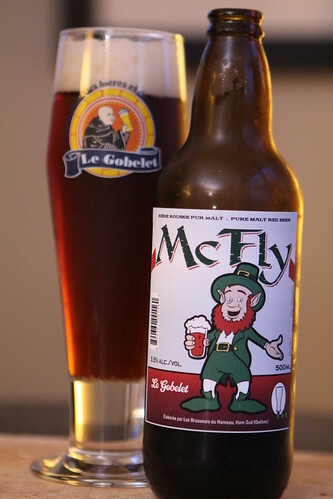 After dinner, I decided to celebrate Irish tradition the way that Biff Tannen would and I cracked open this McFly, another beer Le Gobelet. I still remain thoroughly impressed with these beers. I'm very much looking forward to the next entry in the series. As St. Patrick's Day and its myriad leftovers come to a close spring is upon us. I will be skipping spring seasonal beers this year in order to make a dent in my ever-accumulating beer collection. It also helps that spring happens to be my least favorite of seasonal beer offerings. By the time I crack into another seasonal beer the Wombats may be a year old.